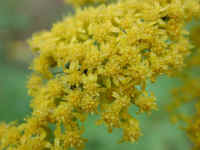 (Canada Goldenrod (Solidago canadensis) - 10) The Canada goldenrod is the most common of the approximately 125 species of goldenrod that exist in North America. Most of the species are located in the Northeastern United States. 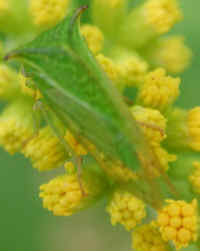 This is a photo of the early blooming (bud) stage of the Canada goldenrod. (Canada Goldenrod (Solidago canadensis) - 01) In this photo the Canada goldenrod blooms are beginning to branch out and develop their characteristic arching plume. 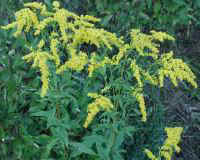 There are several other similar looking species of goldenrod, but we believe this to be the Canada goldenrod. (Canada Goldenrod (Solidago canadensis) - 01a) This is a closer view of one of the flowering plumes of the Canada goldenrod. 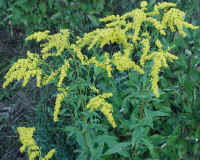 One of the characteristics of the Canada goldenrod is the parallel veined and saw-toothed lanceolate shaped leaves. The parallel veining is most evident on the underside of the downward facing leaf in the lower left of the photo; and toothed edges are evident on the leaf in the lower right of the photo. 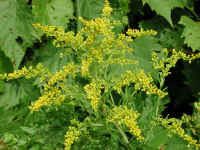 Trevor Kuipers kindly wrote to us about the potential identification problem of the parallel veined leaf of the Canada goldenrod making it seem like it was a monocotyledon plant when in fact it is a dicotyledon plant. Cotyledon are the seed-leaves that first appear when the seed sprouts. For example grasses, which have parallel veined leaves, are monocotyledon plants because they have only one leaf on the sprout, and beans are dicotyledon plants because they have two leaves on the sprout, as does the Canada goldenrod. 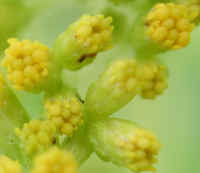 (Canada Goldenrod (Solidago canadensis) - 02) The Canada goldenrod is a member of the Composite or Aster family, because its blooms are made up of many tiny flowers, which can be seen in this enlarged photo of their bud stage of development. (Canada Goldenrod (Solidago canadensis) - 03) The Canada goldenrod is appreciated by many of God's creatures, one of whom had come for a visit prior to our taking this photo to archive his or her presence. (Canada Goldenrod (Solidago canadensis) - 04) The Canada goldenrod has been appreciated by many humans, too, which is evident in its scientific name, Solididago (Latin: solidus), which means "whole", as in "to make one whole", because of its use in herbal medicines. 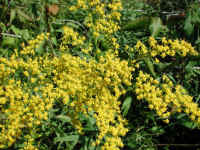 In this photo, the Canada goldenrod flowers are beginning to open, and the ray flowers have become evident. 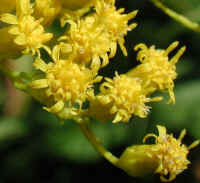 (Canada Goldenrod (Solidago canadensis) - 05) This is an enlarged photo of the Canada goldenrod flowers as they begin to open. (Canada Goldenrod (Solidago canadensis) - 06) Each flowering bloom that makes up the plume of the Canada goldenrod has 9-15 ray flowers and approximately 7 central flowers with 5 petals on each one (they are so tightly packed together that it is hard to be sure of the exact number of petals). 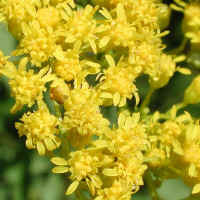 (Canada Goldenrod (Solidago canadensis) - 07) This is another enlarged photo of the the Canada goldenrod flowers. In the lower left bloom, the five petals of a central flower can be more easily seen. (Canada Goldenrod (Solidago canadensis) - 08) This is a small patch of Canada Goldenrod with mature blooms that we spotted on the side of the road during one of our walks. (Canada Goldenrod (Solidago canadensis) - 09) In our ministry of compassion and non-violence, we are constantly being bombarded with reports and photos of human and animal abuse, and of the atrocities taking place on factory farms and in slaughterhouses and laboratories; so it's nice to take a walk to clear our heads and see the beauty of God's creation in these Canada goldenrod and other wildflowers. By publishing these photos, we hope we all are able to enjoy this beauty at any time of the year. Our constant hope and prayer is that we humans would wake up to the horrible atrocities and destruction we have been doing, turn from our evil ways and really learn to appreciate the beauty God created in each of us, the animals, and the world around us; and to never again hurt or destroy, for we would be filled with the knowledge of the Lord as the waters cover the sea (Isaiah 11:9).